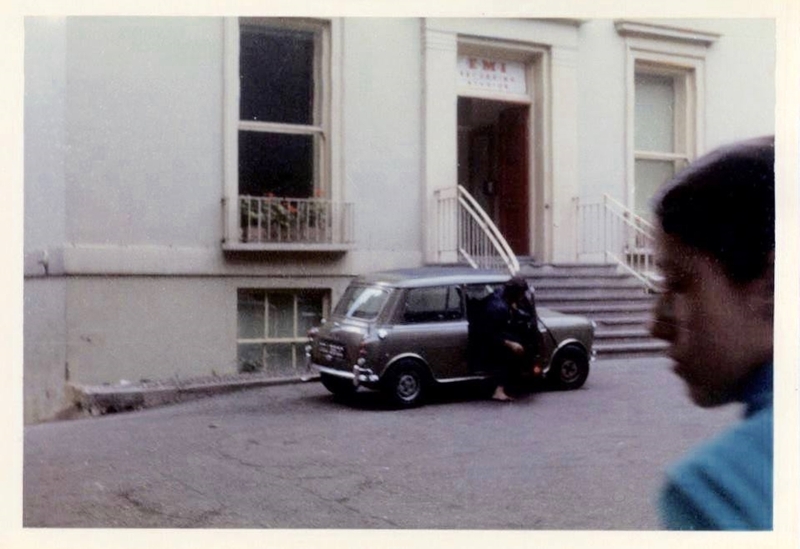 Paul in a blue suit without any shoes getting into his green mini outside of EMI while Lizzie looks on---yeah seems like another day in the life of the Beatles in 1969! Good morning my dear friend! This photo surfaced sometime last year. I imagine there must be many like it with my friends and I and our boys, since there were so many tourists taking photos in the Summer of 1969. It's always a pleasant surprise! Paul came to the studios with no shoes a few times, at least one of them walking from his home. So... when I saw the Abbey Road cover I didn't think much of the fact that he had no shoes on. Regards to all from yet another hot Summer morning in Rio de Janeiro! Can't stop looking at this beautiful image. As meaningful as Altamont - it could be titled: 'The End of the Sixties'. Maybe Abbey Road photo-shoot day? 'Lizzie Looks On' would be a good title for an article. Very cool photo. Love Paul's customised mini (painted to match his Aston Martin) and his barefoot insouciance.